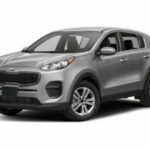 2018 Kia Sportage is a compact Sport Utility Vehicle produced by the Korean automaker Kia Motors since 1993 in various generations: the first was produced until 2002, the second was presented in 2004 and was produced until 2010, the third is unveiled in 2010 and has been in production until 2016. 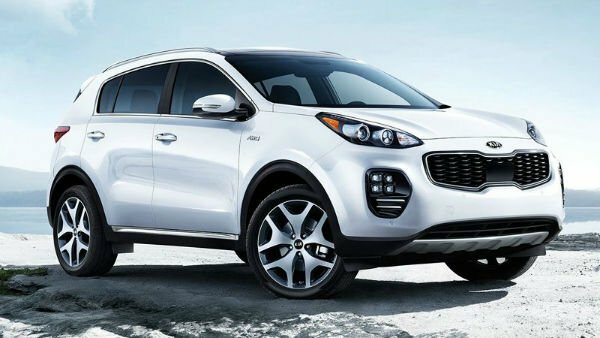 From the second series, the Sportage is classified in Europe as an SUV belonging to the C segment. 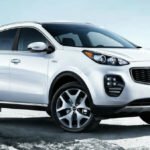 The Kia Sportage2018 is designed by Peter Schreyer, head of the Kia brand design, along with Massimo Frascella, director of the exterior styling of the car. It adopts the last family feeling introduced by the house characterized by taut and muscular lines, compact body and high ground clearance. The front is characterized by the large chrome grille called Tiger Nose with the Kia brand placed in the center, the triangular headlights are thin and in the tip versions integrate the LED daytime running lights, in the lower part there is an air intake that runs throughout the bumper and connects the two fog lights in the shape of “boomerang” placed at the ends. A protective strip of dark plastic is present under the bumper to avoid scratching the body off-road. The sides are tall and solid with a large rear upright and with a visible wheel arch, a rib in the lower part of the doors gives impetus to the bodywork. The flagship models also feature turn indicators integrated into the rear-view mirrors and a chrome strip that extends around the side glazing. The tail is characterized by a small rear window and LED drop lights, the license plate has been moved on the bumper and in the lower part, there is a protective raw plastic band. 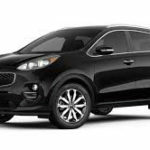 The particular design of the Sportage allowed obtaining an aerodynamic drag coefficient equal to 0.36. For foreign markets, the car is also available with a different front grille which, in addition to the chrome inserts, has dark inserts. 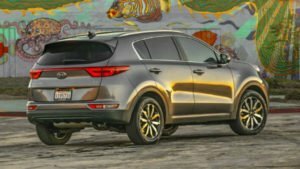 The 2018 Sportage interior is designed by Ralph Kluge, the cockpit is configured to carry five people, the trunk has a minimum volume of 564 liters that rise to 1,353 liters with the reclining rear seat. The style of the bridge resumes that of the exterior, with a massive plank and rounded style: in the center is the screen of the multimedia system composed of ‘ car radio or satellite navigator with touch-screen, in the lower part is a toolbox that reports the information on the onboard computer. The air- conditioning vents are located at the ends of the car radio. The climate controls are located on the lower level of the dashboard and in the lower part there is a compartment that also houses the cigarette lighter and the USB, iPod and AUX inputs of the car radio. The top models also feature push-button start via Smart Key. The exchange has a curious round base. The instrumentation has a “binocular” shape with the tachometer in the foreground that houses in the center an LCD screen that shows the information of the onboard computer, the other instruments are placed in the background; on some versions, there is the Supervision Cluster system that allows self-adjusting the brightness and color of the backlight. The panoramic sunroof is able to filter 99% of UV rays. 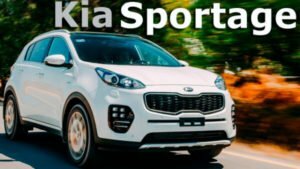 The motorsport range of the Sportage 2018 consists of a petrol engine and two gallons of diesel offered at various power levels. 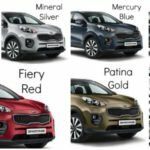 The petrol range consists of the 1.6 GDI four-cylinder with direct injection of GDI petrol and variable valve timing CVVT, six valves with the block and aluminum head and double overhead camshaft delivering 135 horses at 6,300 rpm. The maximum torque available is 164 Nm at 4,850 rpm and the performance declared by the house is a top speed of 178 km/h, stroke 0-100 km / h in 11.5 seconds and consumption in the mixed cycle of 14.7 km / l with 158 g / km of carbon dioxide emitted. The 1.6 GDI is Euro 5 approved and is combined with a six-speed manual transmission and only front-wheel drive. 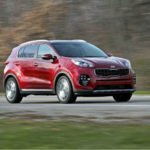 The 2018 Kia Sportage diesel range consists of the 1.7 CRDI four-cylinder engine, part of the U2 engine family with the double overhead camshaft, cast-iron block and aluminum head, four-valve distribution per cylinder, VGT variable geometry turbine, direct injection common rail and standard diesel particulate filter. It delivers the maximum power of 115 horsepower at 4,000 rpm for a maximum torque of 260 N.m delivered at 1,250 rpm; the declared performances are a top speed of 173 km / h, shot 0-100 km / h in 12.3 seconds, average consumption of 18.9 km / l (which drops to 17.9 km / l with alloy wheels 18 “) and emissions of 139 g / km of CO 2 (147 g / km with 18” wheels). 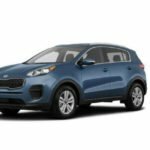 The 2018 Kia Sportage1.7 CRDI is combined with a six-speed manual transmission and 2018 Kia Sportage front-wheel drive.